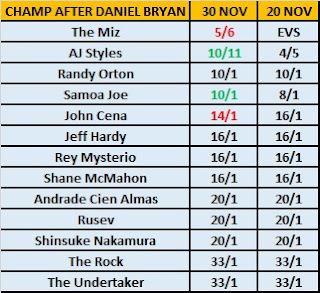 Sky Bet a market that was first a few days ago where clients can place wagers on the person who succeeds Daniel Bryan as WWE Champion. When it was initially installed, former champ - AJ Styles - was a 4/5 favourite. He has since drifted out to 10/11 due to The Miz's price moving in from EVS into 5/6. Styles is Bryan's opponent for WWE Tables, Ladders and Chairs 2018 on December 16th. I surmise Miz's price moving in is due to punters with the opinion that the Bryan/Miz feud will be renewed if - or when - Miz turns babyface. In a way, it would be an interesting twist to the animosity between the two characters, but - as far as I can see from TV - it very much looks like Miz and Shane McMahon are destined to feud together in the very near future. John Cena's odds were cut from 16/1 into 14/1 today. That one is on me as it plays into an idea I have that Cena will challenge Bryan for the Championship in order to get his seventeenth world title win.